It is not like I do not have enough fabric related addictions - solids, batiks, long arm quilting, to name just a few. We all do, right? But this one was unexpected, especially since I lean towards a more contemporary design. I got addicted, head over heels sucked in wool applique! A really good friend, and a fellow QB member, was always into it and all it took is for her to take me to the Primitive Geathetings booth on two quilt shows and I was hooked. It's all her fault . Wool feels wonderful when you touch it, and wool applique is not the scary, über precise applique, and it pops right up when you quilt it. I cannot stop going through my small but sweet stash of wool I bought on eBay. I guess I am hooked! It is one of those more expensive addictions, but nevertheless so sweet! Share some pictures soon! I want to start felting, but don't have enough space in my craft room. I love working with wool, I use embroidery floss and do a button hole stitch,by hand.There are so many beautiful colors and patterns now. I have also gone to Goodwill and thrift stores and bought items that are wool and used them. Do you use them on Bed quilts or wall quilts? How well do they wash if you use for beds? I LOVE WORKING WITH WOOL! MAKING WOOL BED QUILTS! they wash up beautifully- wool is fabulous to work with- makes very warm, luxurious, expensive (looking and cost) quilts worth every cent! 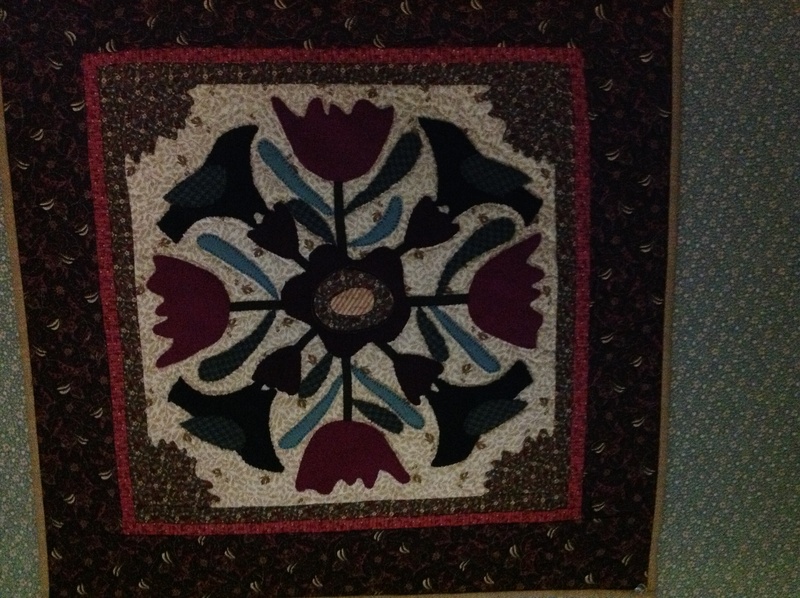 my first completed wool applique quilt was appraised for $3700! and it was only 70" square. I generally do wool applique on really nice double sided flannel- but have done plenty of regular cottons, and wool backgrounds- visit Primitive Gatherings, the Wool Lady, and Sue Spargo to see some great examples of the wool projects being done. here's my 'Backyard Gathering' wool quilt- been washed and dried- in the washer/dryer 4 or 5 times- just gets better. 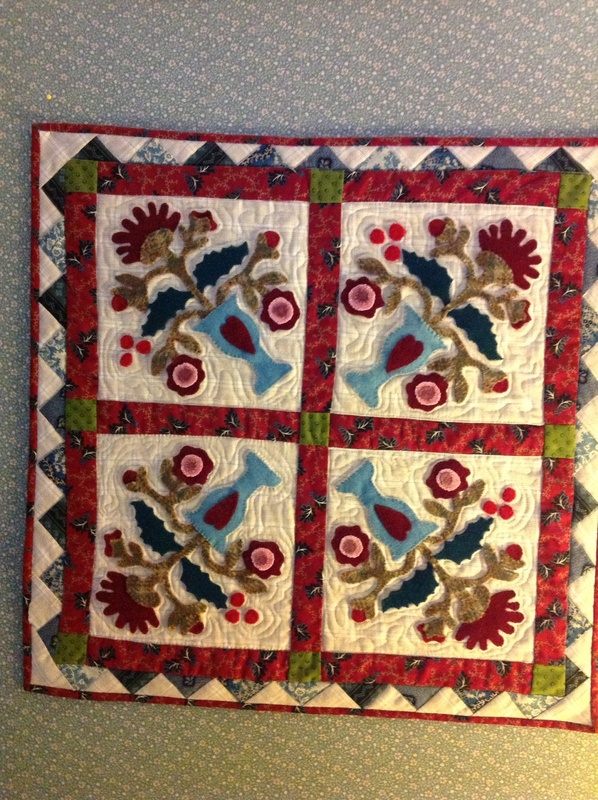 Gorgeous, gorgeous quilt. 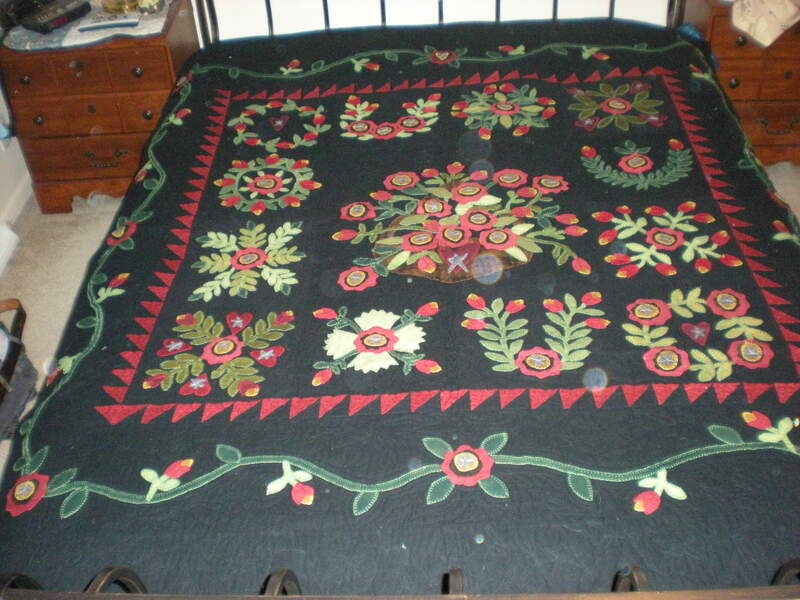 there is a wool applique BOM at Keepsake Quilting similar to that I've been stalking. Sorry to ask a stupid question, but can that be done by machine. I haven't ordered the kit because I have no interest in hand applique. I love wool applique too. Have been collecting wool from thrift shop clothes. So much fun! Here are a couple of little ones I've done. It is my understanding the allure of wool applique is it is all raw edge, you don't have to turn under because it doesn't fray because the wool has been felted (washed and dryed so it shrunk up good and tight). At least that is my understanding. You just buttonhole stitch around. But do you have to fuse it? I haven't inspected it closely when seeing it at booths or in shops. It is very appealing though. I want to master needleturn first though. The quilts she had on display were beyond gorgeous! Hope to get to it soon. Good tips about buying wool from thrift stores. I bought myself a birthday gift of a small wool wall hanging in January an am ready to get started on it. I plan on hand applique. It is a Primitive Gatherings. The directions suggest a #24 chenille needle. Good suggestion? Also, when I wash it the first time, do I wash on gentle or more of just a soak and throw in dryer? This one makes me nervous. It's about 24" sq and I paid $75.00. Don't want to mess it up! Any other tips? I love using wool also. One of the first quilts I made was from black/grey wool from coats at the thrift stores. I washed and felted it, cut it into different size squares and rectangles, hand embroidered a few primitive, large stitches flowers on each piece. Sewed them all together, backed with flannel and gave it to my son and his wife. They said it was so heavy they would be able to stay warm at the North Pole, but they loved it. I still buy all my wool at thrift stores. When I find a piece of really beautiful wool I am elated. [QUOTE=feline fanatic;6235291]It is my understanding the allure of wool applique is it is all raw edge, you don't have to turn under because it doesn't fray because the wool has been felted (washed and dryed so it shrunk up good and tight). At least that is my understanding. You just buttonhole stitch around. But do you have to fuse it? I haven't inspected it closely when seeing it at booths or in shops. It is very appealing though.